Home > Archive > Press > Max Biaggi 2010 World Superbike champion on an Aprilia: this is the Italian rider's fifth World Championship. Max Biaggi 2010 World Superbike champion on an Aprilia: this is the Italian rider's fifth World Championship. Imola, 26 September 2010 – Max Biaggi is World SBK champion at the end of a difficult and exciting weekend on the Imola track. 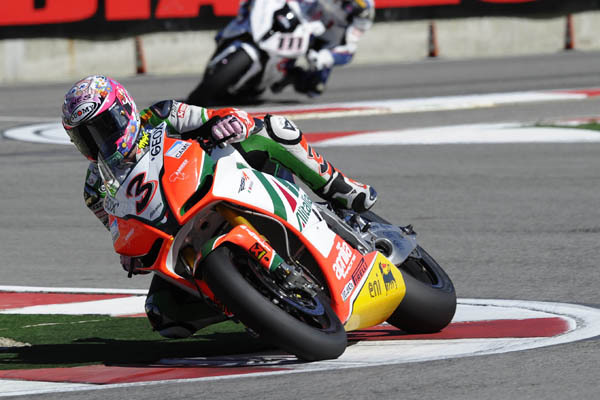 Thanks to the fifth place earned in race 2, Biaggi brought the point gap to 63 points between him and Leon Haslam (Suzuki), who was the last rider in contention for the title (413 to 350). A gap impossible to fill with only the French round at Magny Cours to go until the end of the season. Max Biaggi – with his fifth title after four consecutive world championships, from 1994 to 1997 in the 250 class – is the first Italian World Superbike champion. In the manufacturer standings Aprilia (433 points) is 41 points ahead of Ducati (392). Nine points will be enough for the Veneto-based team to take the manufacturer championship. But Imola was not the site of a simple race day: delayed at the start of race 1, Biaggi had to settle for a placement (11th). Race 2 was an entirely different story. Abandoning any use of tactics, Max forced his Aprilia RSV4 into the front positions, battling for the podium right from the first turn. The fifth place he ended up with handed Max the championship title a round early and evoked an explosion of rejoicing from the thousands of fans who had come out to the circuit to cheer on the most famous Corsair in world motorcycle racing. 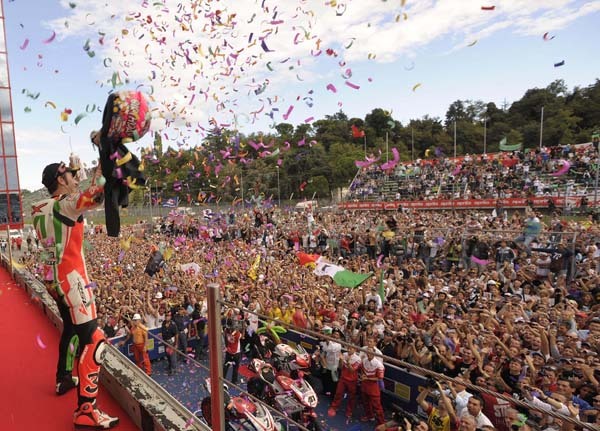 “This is a grand day – commented an exhausted but happy Biaggi in the end – a day which I have greatly desired. I've often felt in past years like I hadn't been placed in the proper conditions to be able to express my worth and to achieve the results that I know I deserve. This is one of the reasons that, at a certain point in my career, I chose this world, the SBK championship, and this is why I wanted to surround myself with the right people for this adventure – because racing isn't just about speed, tyres and an engine. It is also about joy and having fun and with these guys, with this team, I feel at home. I want to thank everyone: my team, Aprilia, Piaggio Group, the chairman. It has not been an easy season. Many riders have won races and if they had been just a bit more consistent, they would have been able to be more troublesome for us. The greatest moments were the double victories at Monza and Misano. It is something very special to win in front of my fans. But it isn't over yet – there is still one goal left – to ride my RSV4 to the manufacturer title. We'll talk again in a week and it would be truly fantastic to close out this wonderful season with another championship". Roberto Colaninno, chairman and CEO of the Piaggio Group (which Aprilia is part of) was in the pit to experience the triumph of his team and rider and had this to say: “Today we achieved an extraordinary result which takes place in the second year of Aprilia’s participation in World Superbike and, once again, confirms the technical excellence of the Noale Racing Division as well as the Piaggio Group in the two-wheel worldwide scene. It would be impossible to imagine anything better on a day like today. We won the World Superbike Championship on an Italian track, with an Italian bike, an Italian rider and a sponsor – Alitalia – which takes Italy all over the world. This has never before happened in Superbike history and this makes all of us that much more proud”.